In the 1970s and 1980s Palm Sunday Rallies were used by the peace and anti-war movement to protest against war and for peace in the world. The last great peace rallies held in Perth focused on the lies of Weapons of Mass Destruction which built the edifice for the invasion of Iraq in 2003. The majority of asylum seekers around the world are the outcome of conflicts such as Iraq, in which Australia is participating in service to big power USA. 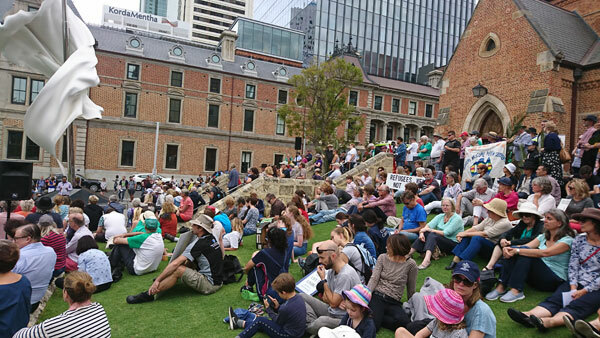 Over 1,000 people from all walks of life rallied for refugees on Palm Sunday last month in front of St Georges Anglican Cathedral in the centre of Perth – church groups, unionists, NGO’s who work with refugees, students and political parties. Bipartisanship on refugees means the ALP was not attending as a political organisation. Also notable by their absence was the corporate media, which ensures the invisibility of refugees and their branding as the “other”, to be scapegoated and despised. One of the first speakers was Mehdi, a former refugee from Iran and one of the original incarcerated prisoners of the camp on Nauru Island set up by the Labor government of Julia Gillard. Mehdi is a political blogger now. He spoke of his own time as a refugee in a camp on Nauru and what life is like there now. The government of South Africa rebuffed Peter Dutton, saying that the violence was also being wrought on black South Africans. This was on top of the Australian government rebuffing the government of New Zealand over their offer to take refugees from Australia’s detention camps to be processed in NZ. Lawrence also noted the Australian government had, in the past year, also commenced cutting off welfare payments to Nauruan refugees who had come to Australia to seek medical attention. These actions were costly in human as well as financial terms. The Australian government, when it acts in this way, also contradicts UN Human Rights covenants on Refugees of which it is a signatory. Today, concluded Lawrence, “The refugees are being ground down in body and soul from the Australian governments refugee policy.” Immigration Minister Peter Dutton himself said after a refugee self-immolated, that they do this in order to come to Australia. The rally proceeded to march through the two pedestrian malls of the city to take their message of compassion and humanity to the Sunday shoppers. On the whole their message was well received. The Communist Party of Australia condemns the policy of the federal government of offshore detention and processing of refugees, which scars refugees who are already suffering trauma as a consequence of the treatment in their country of origin which caused them to leave in the first place. The CPA calls on the policy of mandatory offshore detention to be scrapped and for all refugee processing to be carried out onshore in Australia and preferably in the community so they can have access to badly needed services.